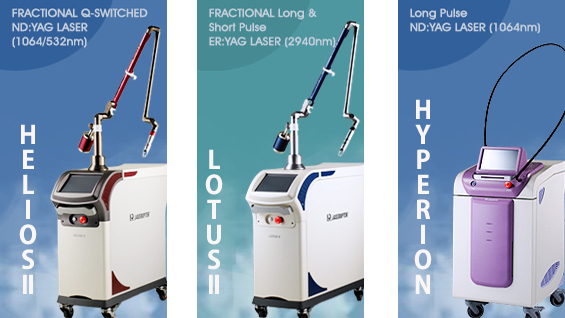 Current trends in minimally invasive treatments have moved past correcting a stationary face but achieving natural improvements that accommodate movement of the soft tissues and facial expressions. We have come to pursue not just volume enhancement but correcting all depths of skin layers, symmetry, and the overall balance of facial features. The goal of soft-tissue filler treatment now is to create an outcome that appears natural in both a poker face and expressive face. Therefore, aesthetic plastic surgeons have moved past just focusing on the bone structure to considering the balance of the entire face. This means they need to examine the anatomy and composition of facial soft tissues and how they change with age. They also need to correctly understand each patient’s unique characteristics and today’s aesthetic standards as well as perform accurate facial analysis. Image 1. An attractive face – Oval Face Shape. 1. Rhee SC. The average Korean attractive face. Aesthetic Plast Surg 2006;30:729–730. 2. Rhee SC, Lee SH. Attractive composite faces of different races. Aesthetic Plast Surg. 2010;34(6):800-1. There are a few conditions that need to be met to go beyond simple localized volume enhancement and to create an overall balance of the entire face with soft-tissue filler treatments. Image 2. An attractive face – Smiling Face. Jessika Golle1, Fred W. Mast and Janek S. Lobmaier. Something to smile about: The interrelationship between attractiveness. and emotional expression. COGNITION AND EMOTION, 2014, Vol. 28, No. 2, 298310. First, we need to first think about the desirable outcome of minimally invasive treatments. This is an oval face or an inverted egg-shaped face where the facial width gradually narrows from the mid- to lower face. 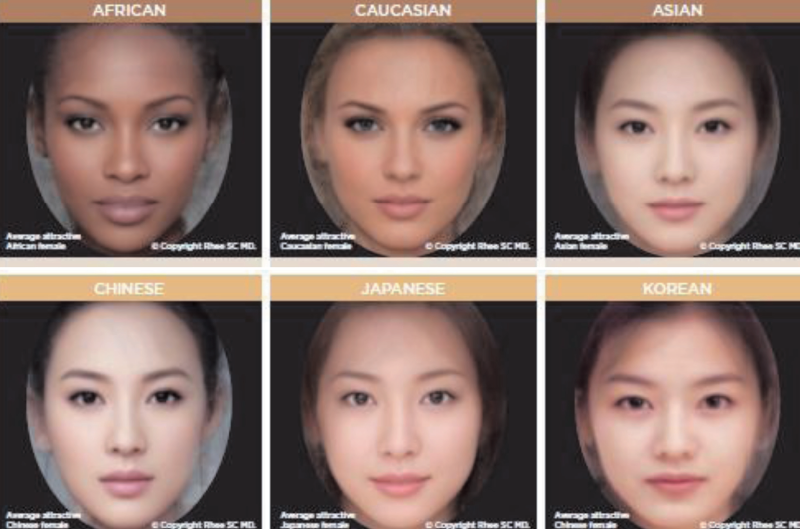 Dr. Seung-chul Rhee examined differences in the composite female attractive faces of different races and found that regardless of racial differences, average attractive female faces all had a narrower lower face than the mid-face (Image 1). As we are naturally drawn to a smiling face than an expressionless face, plastic surgeons need to consider the change in soft tissues in a smiling face when correcting soft tissues. A famous psychological study published in 2014 examined likability of different facial expressions including poker face and smiling face. 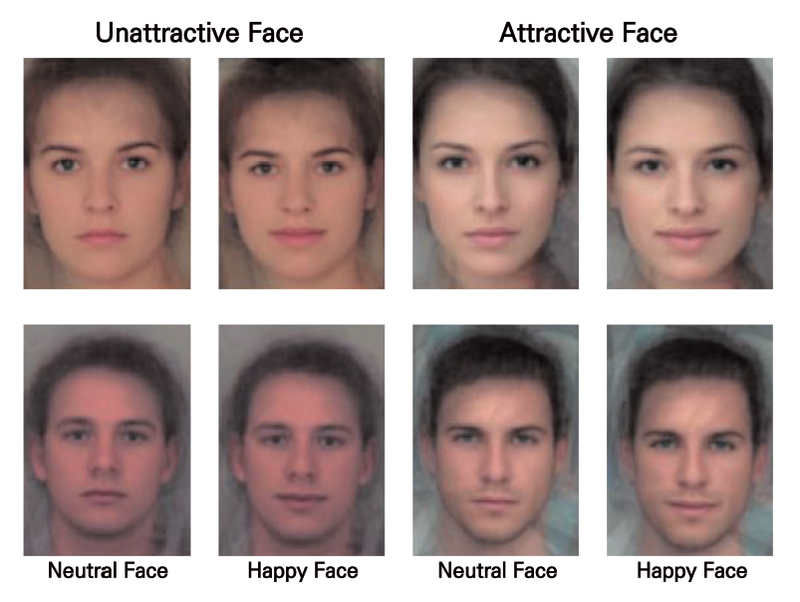 It was found that among poker faces, people liked attractive faces better but between average smiling faces and attractive poker faces, they liked the average smiling faces better (Image 2).